Cooke, S. (2010). Developing song worksheets for a SALC. Studies in Self-Access Learning Journal, 1(2), 129-138. Following student feedback on using songs and music in the SALC at KUIS, song worksheets were designed, created and successfully added to the materials available to students for self-access study. This article describes the rationale and process of implementing the worksheets in the centre. In demanding of our students the need to acquire more vocabulary and to develop their use of the language under study in a variety of contexts, we need to offer access to materials which offer learners greater opportunities to come into contact with the languages being learned. Tomlinson (2010a), in setting out his “Principles of Self-Access Materials Development” states the need to “make sure the texts and tasks are as interesting, relevant and enjoyable as possible so as to exert a positive influence on the learners’ attitudes to the language and to the process of learning it”(2010b, p. 90). Murphey, in the introduction to his book “Music and Song” (1992) explains the attraction for both teachers and learners in using the medium of music: “Songs in general…use simple, conversational language, with a lot of repetition, which is just what many language teachers look for in sample texts. The fact that they are affective makes them many times more motivating than other texts” (p. 7). Indeed, the large amount or resources available for using songs and music in language learning is testament to their perceived value in this field. The SALC at KUIS has a budget for the purpose of purchasing DVDs and CDs for student use. There are now over 1,200 DVDs and nearly 1,000 audio CDs (of which approximately 90% are music CDs and 10% spoken word CDs) for students to borrow, or to use in the SALC. Following successful development of materials for the DVDs, such as dictation, shadowing and recitation activities, it was believed that similar materials could be created for use with the large number of CDs available. The existing teacher-created worksheets for the audio CDs were being underused and were in need of alteration to address copyright issues, specifically the reproduction of song lyrics. In addition, student surveys indicated that the worksheets were going unnoticed. Having decided upon this area of materials development, we needed to devise activities which would best suit student goals. In order to garner student opinion on what would encourage them to use song worksheets, students enrolled in one of the beginner courses at KUIS were asked to complete a questionnaire about using songs to help them learn English. 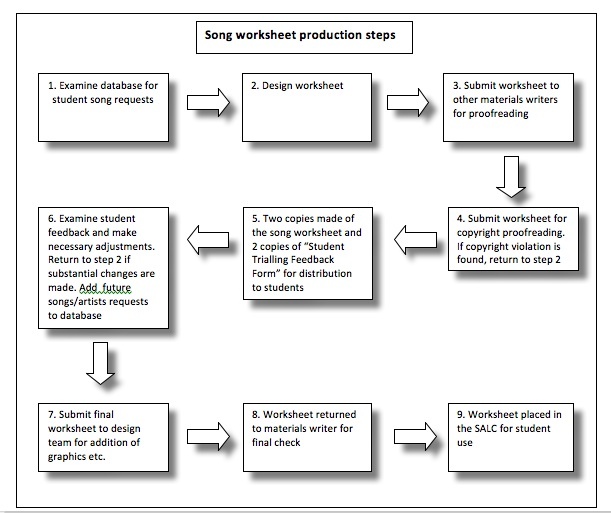 The gathered data suggested that students would find value in the creation of song worksheets in the SALC if they i) featured songs by their favourite artists and ii) could be completed within 30 minutes. The names of artists whose material they would like to study were also collated. In developing self-access materials, Tomlinson (2010a) advocates the use of a text-driven approach, where instead of creating materials with specific language points in mind, the activities should seek to teach any language that naturally emerges and seems to be useful to the students. The approach seeks to encourage students to “articulate personal responses to the experience and…finally return to the experience in order to focus on a specific linguistic or pragmatic feature of it” (Tomlinson, 1994). Songs are particularly applicable for these activities in the way that they may be appropriated by listeners for their own purposes. As Murphey (1992) explains: “most pop songs…do not have precise people, place or time references. For those who find them relevant, songs happen whenever and wherever one hears them and they are, consciously or subconsciously, about the people in one’s own life” (p. 8). With these ideas in mind, it was hoped that we might be able to incorporate opportunities for student reflection in the activities. One reservation to using this approach exclusively in our materials design was the feeling that many students might be approaching the worksheets out of curiosity of lyrical content, having been initially attracted to the melody or the accompanying video clip of the song in question, rather than through a desire to ‘interact’ with the lyrical content reflectively and critically. It was therefore decided that while we would incorporate a section for reflection, the majority of the exercises would be based on helping the students to gain greater understanding of what the song was about and how various linguistic elements worked to describe the characters and the emotions being portrayed. In creating tasks to assist students in language learning, Nunan (1999) suggests the use of the ‘form-function principle’, to address the problem whereby learners “…find it difficult to see the functional purpose for having different linguistic forms” (p. 28). Nunan suggests the design of tasks that “…require learners to use inductive and deductive reasoning to develop their own understanding of the relationship between form and function” (ibid.). In an attempt to follow these guidelines and create practical and accessible activities, a template was devised to assist in creating tasks for the worksheets. The template has sections dealing with vocabulary (often incorporating the differences between written and spoken English), phrases, figurative language, dictation, post-listening exercises (asking the students to reflect upon the meaning or message of the song) and pronunciation (see appendix i for examples). Keeping in mind the 30-minute request for worksheet completion as requested by the students, the materials writer will select and create a worksheet for a number of these sections. Where sections are omitted in the worksheet exercises, they are suggested as ideas for future study. On the final page of the finished worksheet, students are reminded that they can request material for the SALC to purchase and for additional worksheets to be made. These comments are then passed on to the materials writers for the cycle to begin again. One request that is often made is for us to provide the students with a lyric sheet to help them complete the activities. Unfortunately, copyright regulations do not permit the reproduction of lyrics in a self-access centre in Japan. There are, however, a number of ways for the students to access the lyrics themselves. The worksheets suggest that the students can access the large number of lyrics databases found on the internet or make note of the words themselves as they sing along to the karaoke versions of the songs, found on the karaoke software installed on the computers in the SALC’s speaking booths. In the initial questionnaire, many students had mentioned that they were unaware of the existing, song worksheets. As Tomlinson (2010a) advocates: “students need to know what is available to them, what it can offer them and what it requires of them” (p. 81). A redesign of the layout of materials available to students means that the song worksheets are now easily noticeable upon entering the SALC. In addition, in order to promote the availability of these and other new materials in the SALC, regular poster promotions, student-focussed twitter and web updates, combined with weekly SALC updates announced in class, detailing new worksheets and other additions to the SALC have been implemented, resulting in increased interest in and use of these and other SALC materials. Simon Cooke is originally from England and has been teaching EFL since coming to Japan in 1999. Simon has a Masters degree in Applied Linguistics and currently teaches at Kanda University of International Studies in Chiba, Japan. His research interests include discourse analysis and vocabulary acquisition. Kershaw, M., Mynard, J., Promnitz-Hayashi, L., Sakaguchi, M., Slobodniuk, A., Stillwell, C., & Yamamoto, K. (2010). Promoting autonomy through self-access materials design. In A. M. Stoke (Ed. 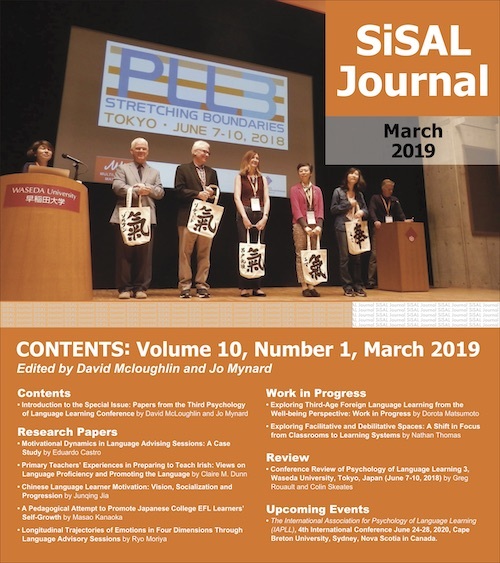 ), JALT2009 Conference Proceedings. Tokyo: JALT.